There are several reasons you need to know how to find property lines. Understanding the boundaries of your property is important if you plan to erect a fence for privacy or add an addition to your home. The last thing you want to do is spend time and money only to upset neighbors, have to tear down a fence, or risk a costly lawsuit. Other reasons you may want to confirm your property lines include determining whose responsibility it is to remove a tree, where you can legally plant a hedge as a border, or if one already exists, whose job it is to maintain it. Doing your homework thoroughly, before you start, is sensible if you want to avoid mistakes. Here’s a guide that shows you how to find property lines, step-by-step. Start off by digging out as much existing documentation as you can lay your hands on. If you have the deed for your property, that’s a good place to begin. Your property deed has a section entitled “legal description” where your property lines are described in words, most likely using the “metes and bounds” surveying system. At first glance, the metes and bounds system may seem a little complicated, but it’s actually quite straightforward. The system works by describing your property lines using a bearing and a distance. For example, it might give a starting point (road fork, boulder, tree) then direction N26W, then a distance, 327 feet to an iron pin, followed by another direction and distance. You can work out your property lines by following your property deed and using a compass and a tape measure. An even better and more accurate source of information is a surveyor’s map, also called a “plat”. It may be with your deed, but it may not. In that case, you’ll have to find it. Some counties even make plat drawings available online. To find the plat for your property, try checking in city or county records at the clerk’s or surveyor’s offices. Another potential source is the former owner of your property who may just be holding on to a copy. 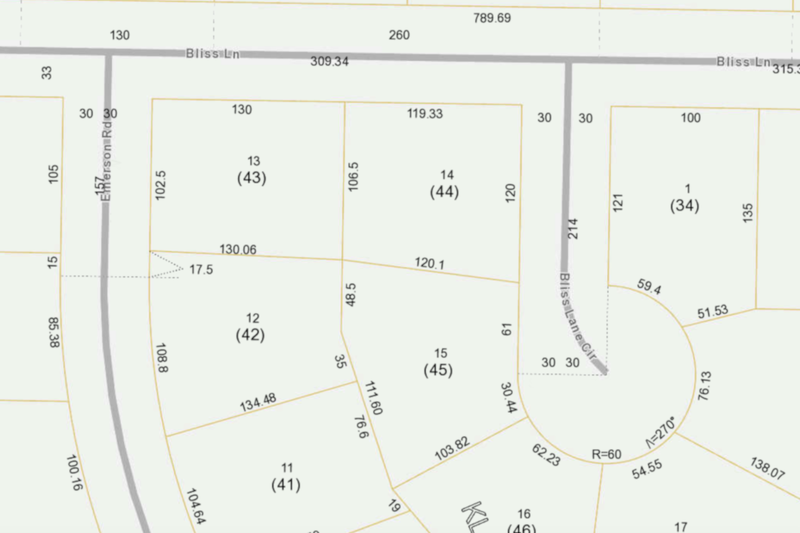 The reason a plat is a much more accurate document than a deed is that it doesn’t just contain a description of your property lines, it also contains accurate diagrams. These diagrams may also reference fixed landmarks and accurate triangulation data to help you. Depending on where you live (city, urban, rural), and the extent to which surrounding properties have already been developed, you may be able to get clues to your property lines from markers such as iron pins, concrete markers, existing fences, street lights, hedges etc. TIP: be aware that markers such as iron pins may have been moved, for example, during tree removal or excavation. Similarly, just because your neighbor has a fence in place, doesn’t mean it’s in the right place. Armed with the information we’ve already covered, you’re in a good position to conduct a basic survey. This can be an interesting exercise, you might even be surprised at what you find. 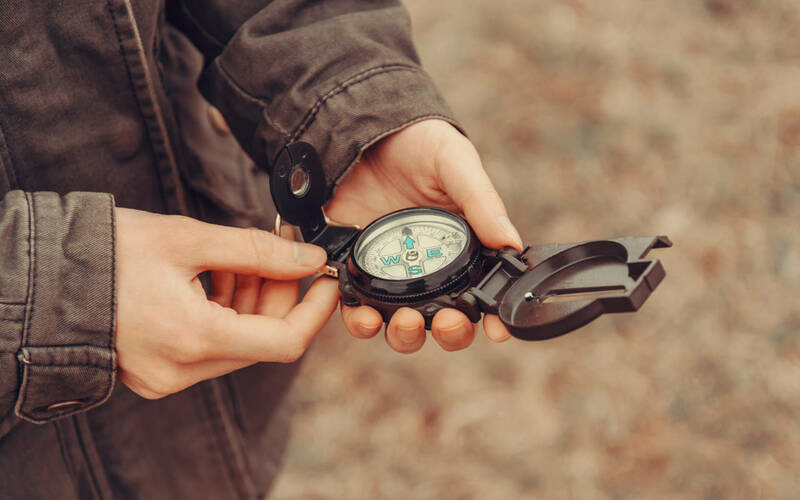 The equipment you’ll need is a compass, a calculator and the documents you’ve been able to collect in the previous steps. Always start from a fixed, known point that appears in your deed or plat. Then it’s a matter of measuring the angles and distances as laid down in your documents and recording the results. You may want to place markers for future reference, and you’ll want to make a sketch of your findings to compare with the official documents. This method can give you a reasonable confirmation of your property lines. In a lot of cases, it’s obvious that everything is in order and your property lines make sense. Remember, only a properly licensed surveyor can adjust incorrectly positioned property lines. And, of course, there’s a cost involved ranging from a few hundred dollars to a thousand dollars or more to employ his services. 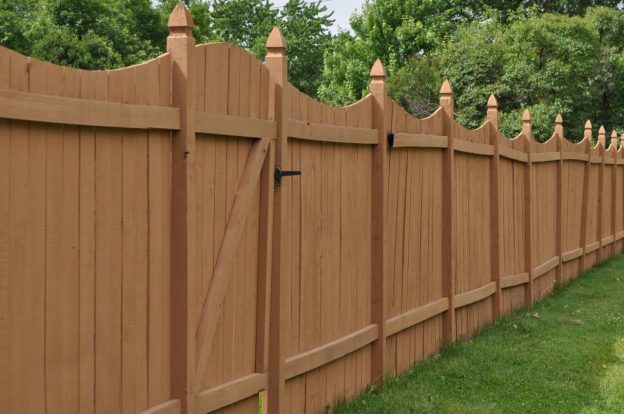 TIP: If you’re planning to put up a fence, it’s a good idea to involve your neighbors in the process. It may not always be practical, but there’s less chance of a problem arising if everyone affected is consulted. You may even be able to split some of the costs (refer to our article “How Much Does a Fence Cost” for more information). It might also be useful to consult your neighbor’s deeds and plats for confirmation of mutual property lines. You’re now armed with the basics of how to find property lines, and the official documents you’ll want to track down. You can confidently work out how much fencing you’ll need for your project using our Fence Calculator or Vinyl Fence Calculator.